As I write this article, 7102 known languages are being spoken around the world. The true number may actually be higher because new languages are still being discovered, and many that are known have never been recorded. Yet linguists estimate that over 50 percent of the languages spoken today are endangered and will have disappeared forever by 2100. The linguistic website Ethnologue classifies endangered languages as Threatened, Shifting, or Dying. A language is Threatened or Shifting when it is spoken by parents who may fail to pass it along to their children. An estimated 1,519 languages, or 21 percent of all those spoken today, are classified as Threatened or Shifting. An additional 915 are classified as Dying, meaning that they are only spoken by the elders in a community and have not been taught to the younger generation. When there are no longer any living speakers, a language becomes Extinct. When Europeans first arrived in America an estimated 312 native tongues were spoken in what is now the United States yet only 151 of these are still spoken today. Of these, 90 percent are in danger of becoming extinct because they are not being passed on to the younger generation. Hawaiian, with only 2000 native speakers in 1995, is considered threatened. Other endangered groups include 50 percent of the minority languages in Russia and 90 percent of Australian aboriginal languages. Since Ethnologue began keeping records in 1950, 373 languages, or 6 a year, have become extinct. A variety of factors contribute to endangerment. These include a reduction in the number of native speakers, migration patterns, support or lack of support within the educational system, and the absence of official government recognition. Other important factors are the average age of fluent speakers, and the influence of other languages. The most important factor, however, is the relative importance of a language in society. If a community is poor and its members can obtain better economic opportunities by speaking another language, this will be regarded as much more prestigious. Parents will encourage their children to learn it and the children may eventually spurn their mother tongue. As a consequence, the community language will only be used in very limited situations and gradually fall out of use. Currently, vast numbers of people around the world are adopting one of the prestige majority languages, English, Mandarin or Spanish for economic survival or to improve employment opportunities. In addition, in a process of cultural imperialism, powerful cultures are suppressing the cultures of minority groups because they regard their own culture as superior. In the process, many minority groups are persecuted and frequently displaced. Partly because of the persecution which results from cultural imperialism and partly because of other factors such as war, famine and natural disasters, the world is experiencing an unprecedented refugee crisis. According to the United Nations, there were more than 43 million refugees at the beginning of 2015. While 15 million of these had fled their country of birth, 27 million remained in their own countries as "internally displaced people". The majority of refugees are women and children, and two-thirds of the refugee population has been in exile for five years or more. As the numbers of refugees around the world continues to rise, families and communities are torn apart and language transmission breaks down. When a language is unwritten, the history of a people, their culture and their knowledge of the natural world is passed down to new generations by means of oral tradition. These unwritten tongues are a potentially rich source of new knowledge. Linguists, for example, use them to trace the history of human migration around the planet and to understand how humans store knowledge and communicate with each other. Scientists access indigenous peoples' intimate knowledge of local ecosystems to identify new animals and plants, to enhance conservation efforts and to develop new drugs from traditional medicines. When the language dies, the accumulated knowledge of countless generations dies with it. A language encodes a value system and defines the thought processes of its speakers and how they express them. It leads its speakers to look at the world and to interact with other people in a specific way, and there are often ideas you can express in one language that you cannot say in another. Language loss is therefore a loss of human diversity, and a loss of alternative ways of thinking and creative problem solving. Loss of language is a loss of identity, and usually goes hand in hand with the social breakdown of communities. A language often disappears because the people who speak it are oppressed. For example, in the 19th century the Canadian government attempted to extinguish native cultures by forcibly taking indigenous children away from their families and placing them in residential schools to learn to become English- or French-speaking Christians. The children were abused and punished for speaking their own languages. This policy of cultural suppression destroyed families and communities and created a multitude of social problems which still effect native communities today. Language loss is not new. Countless languages have changed, evolved or disappeared completely throughout history. What is new is the unprecedented rate at which this is happening in the modern era, a process which has been compared to an environmental disaster. Using this analogy, the loss of a single language may be compared to the loss of a species from an ecosystem, while the loss of an entire linguistic family is comparable to the loss of an entire class of plants or animals. However, loss is not inevitable, and can be prevented by policies which support the efforts of communities to pass their language and culture on to younger generations. Many organizations are working towards this goal. UNESCO supports communities and governments by providing expertise, information and policy advice. National Geographic's Enduring Voices Project is documenting endangered languages and bringing public attention to the issue. It is also identifying linguistic hotspots, areas that have great linguistic diversity in combination with some of the world's least studied and most endangered languages. Google's Endangered Languages Project is a collaborative on-line endeavor aimed at protecting linguistic diversity. The loss of endangered languages will lessen the sum total of human knowledge. On the other hand, their preservation has the potential to restore the health and self respect of communities around the globe and to increase the wealth of human knowledge. Hi HLesley, great article and very thought provoking too. That sounds like something I might be interested in reading. Too bad you can't remember where it was. 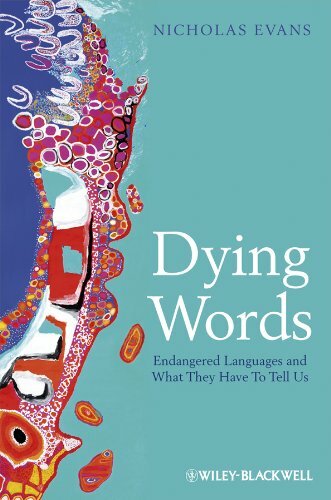 Your line: "When the language dies, the accumulated knowledge of countless generations dies with it" says it all. Great article, congrats on the well-deserved homepage feature too. I love this article. Its very much like my childhood because I attended school with students and teachers from different backgrounds. Filipino was spoken by a group of teachers during their down time. I was even friends with a student whose parents were Vietnamese. High school was a time frame where I heard a variety of languages (outside of the Spanish and French courses) from different students. Not just languages but dialects of a native language. Its quite depressing seeing languages disappearing because of unfavorable circumstances. There was a children's program I saw some years ago where this young girl made it her mission to teach her younger siblings their native tongue so it wouldn't be forgotten. A lovely article. Thanks for sharing with us. Thank you for your heartwarming comments, Browna86. It sounds as if you grew up in an interesting multicultural community. I wasn't exposed to different languages in school (apart from language classes) but living in the UK I used to tune in to radio broadcasts from various European countries just to listen to the "music" of the languages, even though I didn't understand them.